In this session, Sanjaya will discuss best practices of deploying application in Docker and Kubernetes while discussing Docker and Kubernetes concepts. Sanjaya has over 12 years of experince at WSO2, now leading the DevOps/Managed Services team. Prior to joining the DevOps team Sanjaya worked in the Apache Axis2/C project and he's a committer and a product management committee memeber. 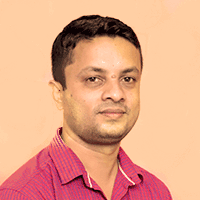 Also his experience spans from developing software for more accurate density functional theory calculations, to Sinhala text to speech translators. Sanjaya worked on computational mathematics and physics for four years at the Institute of Fundamental Studies.